Wondering how the shift to ICD-10 may affect your organization? Transition costs for a 10-physician practice are estimated to be nearly $300,000.1 With five times more diagnostic codes than ICD-9, adopting ICD-10 will present challenges for ambulatory practices. The ICD-10 transition represents a major update to how providers get paid – one that impacts almost every aspect of service delivery, billing, claims processing and reimbursement. ICD-10 will require testing changes in PM and EMRs, billing reporting packages, decision and analytical tools, as well as training coders and providers. 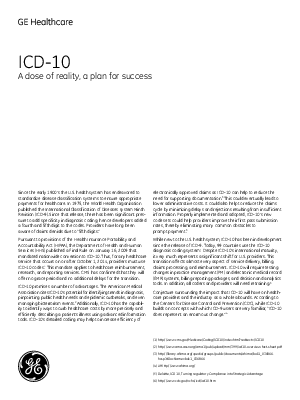 Why prepare now for ICD-10? While the October 1, 2014 deadline for compliance may seem to be in the distant future, an informative whitepaper by GE Healthcare describes the importance of advance planning and outlines a plan for success.